I’m a huge pasta fan and love trying out new recipes. I’m always scanning the pasta aisle for a different noodle to try. That’s when I spotted the mezzi rigatoni on the shelf. Mezzi rigatoni is the same as regular rigatoni, but basically the noodle is about half the length. The sides are ridged, making it great for grabbing and holding your sauce. The pasta that I used is from Barilla but there are other brands out there that carry this specific cut. 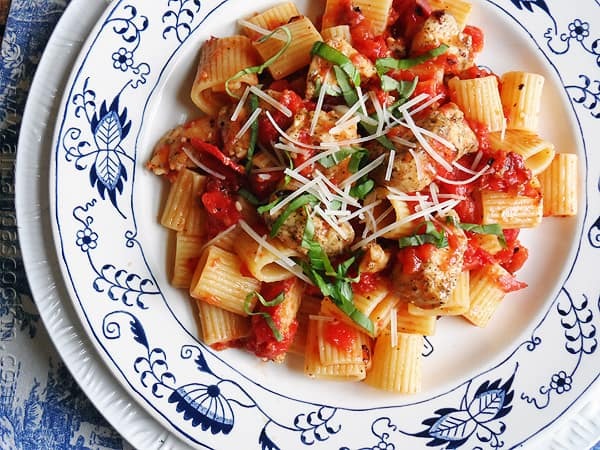 This recipe originally used penne, which I also love, but I wanted to try something different with it. As you probably already know, I’m on Pinterest along with the rest of the world. I have a several boards that are specifically for recipes I’d like to try. All of those boards are prefaced with the word “Food”. 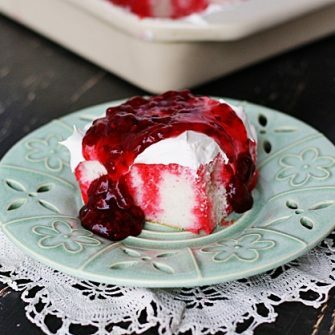 Several weeks ago I pinned this from My Recipes. I pretty much stuck to the recipe, but they say to rub the chicken, which is pretty difficult once its been cut up, so I tossed it in a bowl with the spices instead. I also tossed in a little flour as it still seemed a little sticky. The recipe also called for chicken breast tenders. I just used chicken breasts, no sense paying more for someone to slice it up for me! Lastly, I prefer to use dry Vermouth whenever white wine is called for in a recipe. You can use dry white wine if you prefer, or if you want to nix the alcohol all together, chicken broth will work as well. I really enjoyed this dish! It did need a little sprinkling of salt (or garlic salt if you prefer, that’s what I use) to bring out the flavor. But, that’s a personal preference and you may not need any salt at all. If you try it, please be sure and let me know what you think! 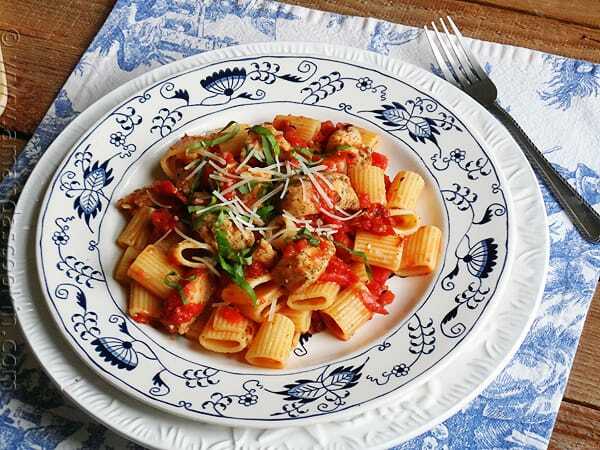 This is one of my all time favorite pasta dishes! Combine first 5 ingredients in a small bowl. 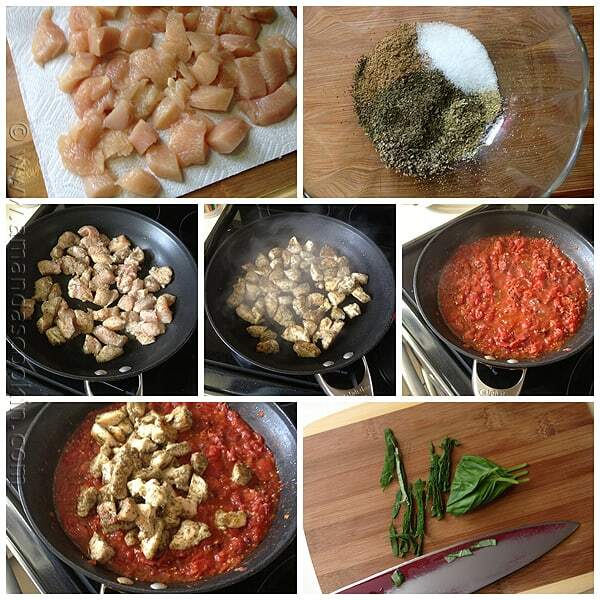 Place cubed chicken in a large bowl and toss with spice mixture until coated. If chicken is tacky, toss in a tablespoon of flour. Place a large pot of water on the stove and bring to a boil for the pasta. Pasta should be cooking, according to package directions, while you are making the sauce. Heat oil in a large nonstick skillet over medium-high heat. Add chicken; cook 4 minutes, turning once. This will form a nice golden brown crust. Remove from heat; set aside. Reduce heat to medium. Add garlic; sauté 30 seconds or until garlic is soft. Add tomatoes and Vermouth, scraping pan to loosen browned bits. Bring to a boil. Reduce heat, and simmer 15 minutes. Add chicken, and simmer 5 minutes. Drain pasta and toss with sauce in a large bowl. Sprinkle with cheese and basil. This looks like the perfect plate of pasta. I love all the noodle shapes and names. Our family was at an Italian restaurant at Downtown Disney last week and the children’s menu had a noodle quiz…our kids hadn’t realized how many noodles there really are, we had so much fun! Great pasta, Amanda! This sounds really delicious, Amanda! 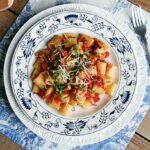 I especially love that it has fennel seed in it – one of my favorites, and the mezze rigatoni is so much fun! Great recipe. Thanks Lana! And, it’s super easy to make! 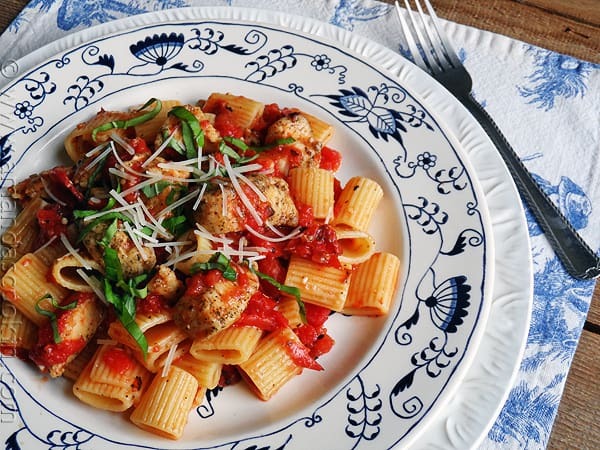 This sounds wonderful – a perfect weeknight meal!! I love checking out noodle shapes too! My husband thinks that I’m crazy because our pantry is packed full of tons of different noodle shapes! haha. This looks wonderful! Will be trying it soon!. 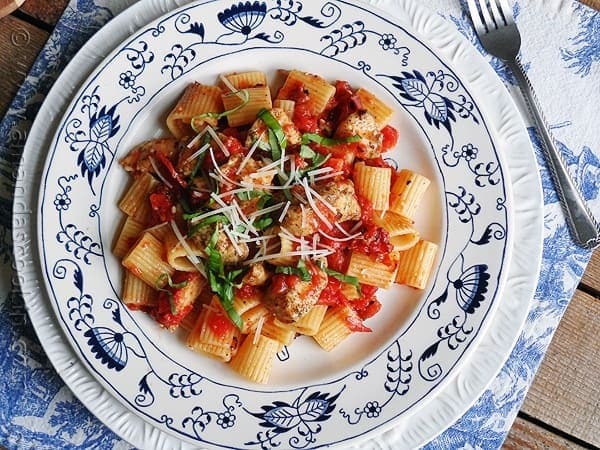 Thanks for linking to my Sun Dried Tomato Chicken Orecchiette too! You’re welcome Angie! Gotta love anything with sun dried tomatoes!